At WWDC this year, Apple senior vice president of software engineering Craig Federighi performed a demo of the company's new augmented reality platform, ARKit, while mentioning popular furniture company IKEA as an upcoming partner in the technology. Similarly, Apple CEO Tim Cook referenced an IKEA AR partnership in a recent interview with Bloomberg Businessweek. Now, Ikea executive Michael Valdsgaard has spoken about the company's partnership with Apple and ARKit, describing an all-new augmented reality app that will help customers make "reliable buying decisions" for IKEA's big ticket items (via Digital.di) [Google Translate]. When it launches, the app will let customers choose which IKEA product they want and then use an iPhone or iPad powered by ARKit to see how the IKEA furniture looks in their own home before it's purchased. 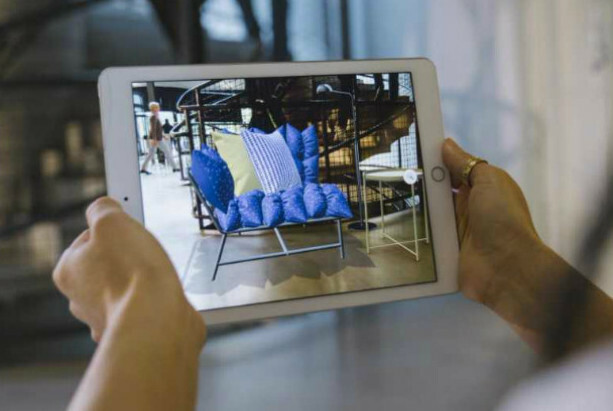 IKEA has been doing this for years now, including an early version which required users to scan pages of an IKEA catalogue to view AR furniture, but the company said that Apple's platform will greatly increase the consistency and quality of the experience. Valdsgaard said that the app will support between 500 and 600 IKEA products at launch with more being added afterwards. The augmented reality experience will even directly play into the development and launch of new products, as Valdsgaard explained that the company plans to first debut new pieces of furniture in the app to give customers a taste of what's coming. "This will be the first augmented reality app that allows you to make reliable buying decisions," said Michael Valdsgaard, digital transformation manager at Inter Ikea Systems, the company that owns the brand Ikea. Going forward, it will play a key role in new product lines. "When we launch new products, they will be first in the AR app." Selling furniture directly within the app is a possibility as well, but isn't the company's focus for the first iteration of the software. Valdsgaard said, "Ideally, you could put a sofa in your home with the help of the app, and then with one click add it in the shopping cart on the site. But we have a tight deadline." Several teams are working on the technology behind the augmented reality app, including one "innovation team" of 150 people located in Älmhult, Sweden -- where the first IKEA opened -- as well as a twenty-person team specifically responsible for the 3D modeling of furniture. The ARKit-powered IKEA app is expected to launch this fall, following the iOS 11 update. Practical implementation such as this will demonstrate the true possibilities to the masses far more than Snapchat. Then again, I forget that we are living in the year 2017 AK (anno Kardashianso). Who will be the first to photoshop unassembled furniture into that photo? This is game changing. Being able to see how things will look when I'm browsing would open up a whole new way to shop for furniture. We had Photoshoped people on Instagram (& Facebook) Now, house, furniture, a sports car, a life-partner... Indeed game changing. A drone and an empty field is all you need to show your Batcave as the technology progresses, no one knows on the other side of the world. And none of this has to do with using ARKit for furniture shopping, so I'm not sure where you're going with this post aside from complaining about society. Yay, a furniture advert app. Is that really what everyone is drooling over? Reminds me of the BBC's "Walking with Dinosaurs: Photo Adventure" that first appeared three years ago. Dinosaurs walking through a jungle on your desktop. Still on iTunes, I believe. That's like saying Amazon is a "detergent advert app" or Opentable is a "restaurant advert app." Would you prefer to just shop at Sears for the rest of your life or take advantage of these advances? I'll put one THERE, and there, and over there, and one there, and here, and two over there. This for me is the killer application of VR for people who aren't interested in gaming. My issue with this is what do you do with existing furniture in your house? Move it out into the garage so you can place AR content? ARKit doesn't help remove existing objects from the screen. First of all, you may have an empty space, and second, there's no reason in principle why AR cannot find your floor (or other surface) and then overlay digital items on top of existing ones. Not really. People aren't really going to wear VR headsets to shop for furniture. VR is also cost prohibitive and impractical in this, and many other commercial applications. VR is probably going to be relegated to gaming and training sims. AR on the other hand is primed for commercial applications such as this Ikea project. AR, from a consumers perspective, only requires the equipment we already own. No need for expensive nor cumbersome headsets and you don't lose the connection with the real world around you. You can't really discuss AR and VR together. They are entirely separate technologies with entirely separate purposes.